The Munich Roos handed out an 82-point drubbing to the Frankfurt Redbacks in the 2005 AFLG grand final played at the Frankurter Ostpark last Saturday, October 29. After having played the preliminary final against Hamburg earlier that day, the Redbacks managed just four behinds for the match, the Kangaroos' lineup with a large contingent of experienced Australians proving almost watertight in defence. UPDATE - In response to this article, WFN has received some feedback claiming that Hamburg actually won the preliminary final over Frankfurt 13-10, but were disqualified. WFN is investigating the matter and will post an update when confusion has been cleared. In the first 9-a-side EU Cup held in London last weekend October 9th, Belgium (represented by the Brussels Saints) defeated Sweden 78-37. Ten sides competed in the cup, representing nations from around Europe. The curtain-raiser to last weekend's AFL Challenge Cup at the Brit Oval, London, was the international match between Ireland and Britain. This wasn't an expat event, both sides were composed fully of Irish and British lads under International Cup qualification criteria. 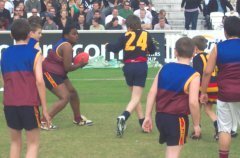 Unlike the Eagles v Dockers match that followed, the game was also Australian Rules by the rulebook - in other words it was melee free, and the standard impressed the crowd that had grown by the last quarter to several thousand. We got the views of some of the people involved and some ideas of future plans.